Need a diagram showing all the pieces on the board. Can you give us something visual? As one of the famous Stratego players would say: Wall of Text. The save to PDF function of the Board Editor doesn't work how it should yet, what I did in other threads is just make a screenshot and crop that and put it on a image sharing server like imgur. I didn't really look at what is the best way to export HTML to a picture yet, maybe after the Waterloo 2015 World Championship. Is this the situation? If it is, it is very important to know what was the last move. Thanks Morx, for the stratego board editor link and this work up of the situation. Whose move is it is an important question. it has been a while so I do not remember the exact situation so who's move it now is I cannot say. But let's assume it is red's turn. When I look at it though it does not really matter as I stick to the opinion for now that blue should be able to at least get a draw out of this. Blue should of course capture the miner and if necessary offer a piece to get it. 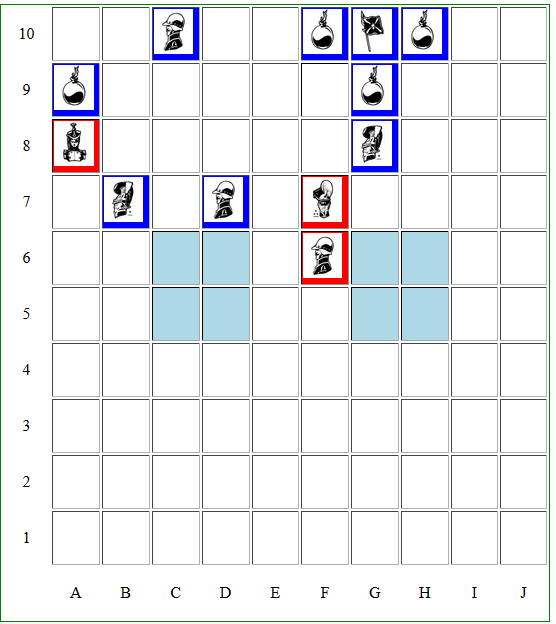 With good play I cannot see blue put the miner past the defending pieces. Can you? if the situation represented by Morx is correct then i would say it is victory for red if red has to move but a draw if blue has to move.